Victoria, Mahe (Seychelles) – November 2, 2017 (travelindex.com) – It was only earlier this year that I promoted the concept of ‘Tourism for All’ as I campaigned in the different parts of the world for the seat of Secretary General of the UNWTO. This was to promote a tourism industry without any discrimination, be it colour of the skin, religious belief, political affiliation, gender, disability, sexual preference etc. These elections for the post of Secretary General of the UNWTO have now come and gone, and today we need to accept that what would be good for a better tourism industry is indeed good for the people as a whole. Comments about racism as an example is only segregation based on the colour of the skin and is always resorted to when all logical arguments are exhausted. These futile and racist slurs can be heard in the global political arena, even amongst certain UNWTO campaigners, but can also be heard in Seychelles by tired politicians who have no other cards to play. Austrian Airlines made its arrival in Seychelles recently after their exciting announcement made to the press well over a year ago. They arrived full of eager passengers and it is said that the prospect of future bookings are excellent. It can even be said that tourism for Seychelles is so integral that it is the bread, butter, jam and even the hand that holds the bread. Today, every Seychellois needs, more than ever before, to stand together to protect and defend this industry that employs thousands of locals. It is also the industry where many Seychellois have invested their life savings. Increasing the tourism industry and its yield is a necessity, and this remains dependent on a good air transport policy for the islands as it does in operational costs. Tourism and Civil Aviation need today to be dancing to the same Sega beat. Aviation in the Indian Ocean Region is working hard to find its rhythm, but challenges remain. Protectionism of National Airlines versus the importance of bolstering tourism and the economies of the islands are difficult discussions, but we learned a painful lesson when the Seychelles tourism suffered after a Russian Airline was refused 5th Freedom Rights to fly on to Mauritius after their Seychelles stop from Moscow. Seychelles is small and cannot expect to be the end of the line for all airlines. South-South air connections could see new Seychelles stops, but the golden 5th Freedom Right must be part of the Open Air-Space policy. Today, the weaker Seychelles Rupee is helping pull in the visitors. However, the cost of operation in the islands is also on the rise because of the necessary imports to keep the tourism industry alive. The weaker Seychelles Rupee is also impacting on the lives of the Seychellois, the hosts to the increased visitor numbers. Data from ForwardKeys reveal continued strong bookings for Seychelles, but the ratio of profit versus costs for operations need to be monitored to ensure the win for the islands is a financial boom for all. This is why the new proposed taxes on salaries of those sitting in the upper salary bracket need to be revisited. The tax burden will need to be absorbed by the businesses and they will, in turn, pass it on to the visitors and this vicious cycle will end up pricing Seychelles out of the market. Instead of pointless politics and launching racial slurs in the National Assembly or in the local newspaper, politicians in Seychelles should be focusing on this real issue at hand, rather than hoping the problem goes away if little attention is drawn to it. On Friday the 27th October, I joined with the Tourism Industry and Members of the Car Hire Association, to be with the Parcou family and their friends when Seychelles said goodbye to Kaven Parcou at the Cathedral of the Immaculate Conception in Victoria. Kaven Parcou was a Tourism Pioneer in his own right. Born in 1941, he was a founding member of the Seychelles Car Hire Association. He passed away on the 20th October and leaves behind his wife, Rose, and son, Pryze. He joined the tourism industry with his two ‘Mini Moke’ vehicles when tourism started in earnest in the islands, and he saw his business grow to enable him to acquire the franchise of Avis Car Hire in Seychelles. Parcou was also the Philippines Honorary Consul in Seychelles. Today, as we share our sincerest sympathy to the Parcou Family, we can add that Seychelles lost a committed Tourism Pioneer. The majority of Members of the Executive Committee of the Seychelles Labor Union (SLU) met last Friday morning at Dolce Vita in Victoria in their final preparations for meeting with the Registrar of Trade Unions on Monday the 30th October. The presentations of Registration Documents to the Registrar was to have taken place on Friday itself but was postponed to Monday at the request of the Registrar. Obtaining the necessary forms has been like pulling teeth, but the Committee Members of the SLU are taking note and ensuring workers are kept duly informed. It is reminded that the formation of a Trade Union by Seychellois is a fundamental right afforded by our Constitution, and to hinder the registration of this Trade Union is to trample upon our right to freedom of peaceful assembly and association under Article 23 thereof. If there was one fish known for its extreme power and aggressiveness, it is the Giant Trevally (GT). These traits make this predatory fish highly prized by avid fishermen, especially in the fly-fishing Industry. Fly-fishing on the Outer Islands of Seychelles has been described as out of this world, where large specimens of GTs are often caught. It is the largest fish in the genus Caranx, growing to a maximum known size of 170 cm (67 in) and a weight of 80 kg (176 lbs). Recently, these fish became even more popular as reports started emerging of them leaping out of the water to catch birds in mid-flight. Although seeming quite farfetched, a filming crew that were searching for extraordinary footage for the natural history series, Blue Planet II, decided to fly to Seychelles to investigate this previously unheard-of phenomenon further. What the crew witnessed next was described as “astounding”. Series producer, James Honeyborne, said, ‘It’s one thing seeing a fish flying through the air, that’s unexpected enough, but then seeing a fish flying through the air and catching a bird in its mouth, wow… yep – a bird-eating fish”. Mr. Harborne went on to describe how the GTs would calculate the predicted flight path of the birds, before intercepting and eating its meal in one impressive gulp. This unique behaviour has baffled the scientific community. Although there have been documented evidence of GTs feeding on small turtles and dolphins, catching birds in mid-air was previously unheard of by scientists. No scientific work, to my knowledge, has been done on the eyesight of GTs. The ability to possibly detect a bird’s flight trajectory is quite a unique feature. Though, from my experience and that of other anglers I have spoken to, when fishing for them it is observed that they do appear to have exceptional eyesight. Specific colored lures and flashy jigs tend to be the only bait that this fish species would prefer at a certain time of day. However, that being said, they may also be more reliant on detecting the sound of splash on the water surface that these artificial lures make, or might be detecting water pressure changes with their lateral line system. Scientific work to track the movements of these amazing fish is currently underway in Seychelles. This research could possibly determine if GT arrivals around the Outer Islands coincide with that of the timing high bird activity/fledging. It could also determine whether this exceptional trait is distinctive to the GTs around the Outer Islands of Seychelles, adding to the hype and to the slogan of the islands: ‘unique by a thousand miles. Simon Esparon launched this landmark entertainment venue 43 years ago. Aged 67, Mr. Esparon was a friend to many and beloved by all. He was also the respected local Butcher, who was passionate about his craft, with his shop located on the same grounds as his nightclub. Simon Esparon leaves behind his wife Marie Josee, his sons, David and Denis, and daughter, Brigitte, as well as two grandchildren. The funeral ceremony at the St. Michel Archange Church at Anse Aux Pins on Thursday 26th October was a sad and emotional event. Both his sons and his daughter delivered touching eulogies, and his very young grandson addressed the gathered crowd as well. Father Lonie Adrienne used his sermon, in the presence of the Vice President of Seychelles and the Speaker of the National Assembly, to passionately lecture everyone on the dire need to rally as a Country to change direction from Seychelles’ current state of ‘lawlessness’ in order to see a return to safety and security, and to instil once again a sense of morality in the youth of our Nation. Father Adrienne spoke from his heart as he delivered a frank assessment of the situation on the ground in Seychelles. A property formally owned by Gills Nageon that operated under the name Drifwood Small Hotel has been fully revamped and is coming soon as “Le Nautique Luxury Waterfront Apartments”. With an eye for modern coastal design yet still reflective of the past, “Le Nautique Luxury Waterfront Apartments”, a beachfront self-catering establishment has been carefully crafted to reflect the rich history and colourful culture of the Seychelles. 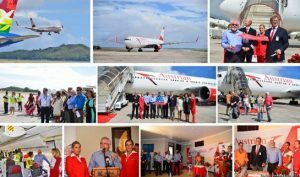 The national carrier of Austria — Austrian Airlines — landed in Seychelles for the first time on Wednesday October 26, 2017. The inaugural flight with 214 passengers onboard was greeted by a traditional water canon salute after touching down at the Seychelles’ International airport, a few minutes before 9.00am. Present at the airport to witness the historic occasion were: Seychelles’ Minister for Tourism, Civil Aviation, Ports and Marine, Ambassador Maurice Loustau-Lalanne, Principal Secretary for Tourism, Anne Lafortune, Principal Secretary for Civil Aviation, Ports and Marine, Garry Albert, Chairman of the Seychelles Civil Aviation Authority (SCAA) Captain David Savy, SCAA’s Chief Executive, Gilbert Faure, Seychelles Tourism Board’s Regional Manager based in Frankfurt, Edith Hunzinger, as well as Lufthansa Group’s General Manager Sales for East Africa, Tobias Ernst. Seychelles is the fourth new destination to be added to Austrian Airlines’ global network of approximately 130 destinations. This follows the signing of an air transport agreement in May this year, between Seychelles and Austria, which are celebrating 40 years of bilateral relations this year. Ambassador Maurice Loustau-Lalanne remarked that Wednesday’s inaugural flight, coincides with the Austrian National Day – on October 26, and more importantly becomes the third airline flying to Seychelles non-stop from Europe, after Air Seychelles and Condor, which operate from Paris and Frankfurt, respectively. “Europe is today giving us 18 percent more passengers than last year and the direct flights will contribute significantly towards consolidating the market, and as it’s a direct flight we are expecting to see a shift towards the high end visitors, which is the segment we are continuously seeking to attract for Seychelles as a tourist destination,” said Minister Loustau-Lalanne. On top of helping to grow the Seychelles’ European market, particularly the German-speaking markets; the newly introduced Austrian Airlines’ service is expected to boost the number of visitors from Austria – a country with over 8 million people. According to the National Bureau of Statistics, a total of 5,943 Austrian visitors have landed in the island nation up to October 22 this year, representing an 18 percent increase over last year, and Minister Loustau-Lalanne is predicting a 40 percent growth in visitor numbers from Austria by the end of this year, up from the 34 percent increase recorded last year. Austrian Airlines – Austria’s largest carrier — is part of the Lufthansa Group, Europe’s largest airline group and a member of the Star Alliance. Lufthansa Group’s General Manager Sales for East Africa Tobias Ernst said Austrian Airlines has been running an extensive marketing campaign since the beginning of the year to promote the flights, which has resulted in the completely full first trip. This he said, has been done in collaboration with travel companies in Europe, which had approached the airline to operate flights to the Indian Ocean archipelago. “It has been a very positive start with the full flight today and the next flights are also fully booked. We are strongly convinced that Seychelles is a very rapidly growing, upcoming, new tourist destination for the Europeans, and that is why we have started today’s flight,” said Mr Ernst. Austrian Airlines will be operating once-per-week non-stop flights to and from Austria starting with its winter 2017/18 flight schedule, using a Boeing 767. The flight departs its main hub – Vienna International Airport on Wednesdays, returning from Seychelles on Thursdays. Vijay Poonoosamy, Vice President of International Affairs for Etihad Aviation Group, and President of Hermes was last week moderating the closing panel of the ICAO Traveller Identification Programme Symposium which had more than 750 participants from more than 120 States. Vijay Poonoosamy, presented “Making air travel more secure and efficient” at the Thirteenth Symposium and Exhibition on ICAO under the Traveler Identification Program of the event, Moderator Session 7: Border Control Management and Future in Travel. The event took place at the ICAO Headquarters in Montreal, Canada, from October 24-26, 2017. We reproduce Vijay Poonoosamy’s address at this important ICAO meeting:- UNWTO has shown that destinations worldwide welcomed 598 million international tourists in the first six months of 2017, 36 million more than in the same period of 2016. IATA stated two days ago that the 4 billion air passengers expected to fly this year are expected to double to 7.8 billion in 2036. With the formidable growth of both passenger numbers and security threats it is self-evident that much more needs to be done to diligently develop a strategic and holistic roadmap to promote safe, secure, sustainable and seamless aviation. In line with UN Security Council Resolutions 2178 (2014) and 2309 (2016) that re-affirmed the importance of border controls to combat terrorism, the interdependent elements of the ICAO Traveler Identification Program (TRIP) Strategy demonstrate that a coherent and coordinated approach to a robust traveler identification management is essential. All the Stakeholders of Travel and Tourism have a vested interest in safe and secure operations and have safety and security as the number one priority. Let’s not talk of balancing security and facilitation as this suggests compromise on either or even both. Let’s focus on promoting a robust, efficient, cost effective, inclusive and harmonized global process to enhance security. Let’s develop a global program to link international security with global connectivity while leaving no country behind. To have a wholly automated, electronic platform, built on verified biometric data, require that a number of areas be addressed, namely, the harmonization of intelligence and data-sharing, the global implementation of common standards set by ICAO and the shift to a secure digital process and a single application system. Governments should agree that a single token that can be used throughout the journey, including airline and airport processes, security, border inspection. Interoperability between countries and systems (customs, immigration, security, airline and airport systems), greater use of available programs such as Interpol’s I-Checkit and greater uptake of on-line and mobile processing are also required. These necessary policy shifts require additional cooperation and collaboration among various agencies of governments, international organizations, the Travel & Tourism industry/businesses and travelers. Moreover, national governments need to implement the international standards established by ICAO and help ICAO assist emerging economies in implementing those standards.The cross-border movement of people will then not only become more efficient, but it will also enable public safety officials to direct more attention and resources to the risk-based identification of threats. As a result, travelers will have a secure and pleasant experience.